Palestinian Authority claims Trump WH turning blind eye to Israeli 'settlements', says Ambassador Friedman's comments are 'unacceptable'. 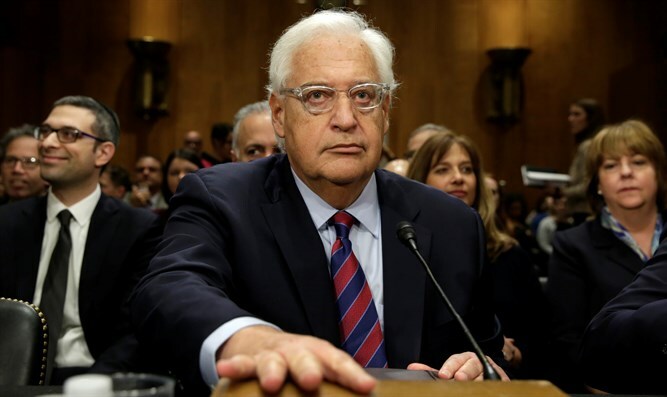 The Palestinian Authority blasted US Ambassador to Israel David Friedman, calling recent comments made by the Ambassador regarding Israel’s presence in Judea and Samaria “unacceptable”. Last week, Ambassador Friedman spoke with the Jerusalem Post, which published the interview on Friday. During the course of the interview, Friedman referred to PA claims that Israel is “occupying” Judea and Samaria, calling Israel’s presence in the area the “alleged occupation”. In response, Saeb Erekat, secretary-general of the Palestine Liberation Organization penned a letter to diplomats lambasting Ambassador Friedman for his comments, calling them unacceptable, AFP reported Wednesday. "Such actions and practices could not have taken place without the complicity of the international community," the letter added. Erekat also alleged that the Ambassador Friedman’s comments constituted a de facto endorsement of Israeli building projects in Judea and Samaria. According to AFP, a US official denied that the ambassador’s comments signaled a change in Washington’s approach towards Israel or Israeli policy in Judea and Samaria. "[It] does not represent a shift in US policy,” the official said.